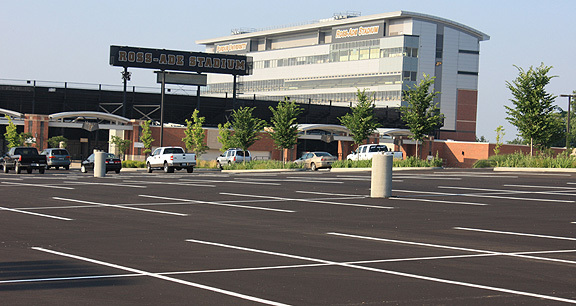 Project obstacles and solutions: Purdue University contracted with Rieth-Riley Construction to replace the asphalt pavement in the parking lot of their football stadium. This included removing all of the old asphalt and stabilizing the sub-base prior to paving. Specialties Company was brought in to do full-depth reclamation of the old pavement. This is a green building process that grinds the old material and tills it into the soil to recycle it as a sub-base for the new pavement. This solves two common construction problems. It cuts back on the amount of new aggregate materials needed and speeds up the construction process because it eliminates the need to load and haul off the old pavement from the site. It also greatly reduces the amount of truck traffic to and from the job site. The sub-base is treated with a bonding stabilization material before it is compacted. This creates a firm base to build upon. This process saves time and materials. Another issue was the location of the stadium parking lot. Ross-Ade Stadium is flanked by an outdoor football practice facility, a golf course, a residential area and busy city streets. Many times dry stabilization materials, such as lime kiln dust or fly ash, are applied to the sub-base as bonders. In this case, there was a concern that the fine dust of these products would become airborne and become a health hazard to people adjacent to the site. It was also a concern that the dust would coat the outdoor practice fields, surrounding buildings, golf course green areas and the traffic on the streets. It was decided to use a wet, slurry mix from IMI as a stabilization material to eliminate the dust problem. IMI provided 500 yards of slurry mix that was tilled into the sub-base. All of this was then compacted before Rieth-Riley paved the finished surface with asphalt. Using the slurry mix in conjunction with full-depth reclamation helped keep this project on schedule and airborne dust to a minimum. For more information on slurry mix, click here. For more information on full-depth reclamation, click here.